I've been wanting to put together a no-compromise guitar rig for some time now that is powerful and flexible yet compact and portable and which is also practical in terms of volume levels and being able to play around the home without shaking the walls. Having owned and managed the Tone Merchants shop, I'm rather spoiled in that I had nearly 3,000 square feet of space (with an acoustically treated venue room to boot) to crank up and wail on dozens of boutique tube amps whenever I wanted. So that's another thing I wanted: the sound and feel of all those amps at a manageable volume. So, this rig is like the Tone Merchants I had x 100 in a box. It's way more flexible and powerful than a $40K+ showcase demo rig I used to have at the shop. But the most important thing is the sound quality and the overall feel in your hands. Fractal Audio's AxeFX II is truly a wonder in engineering. I'm rather amazed that a device like this exists for us lowly guitar players. I've been in the guitar industry for over 23 years now and I've seen all kinds of products come and go and I have never experienced any guitar-related product quite like this. I won't go as far as to say that the amp models feel just the like real deals, but it isn't worse - just different. Sound-wise, I find some of the models sound even better than the amps they emulate. There are around 140 amp models in there and it would take months and months just to get familiar with all of 'em. I've come to appreciate all the different amps more now as an objective observer and tone connoisseur than when I was in the boutique side of the business. Some amps that I didn't care for as much in the past I find I like a lot more now. I now just listen to the sounds and appreciate them for what they are. They all sound great in different ways and I'm glad that I'm not forced to choose one over the other. I can just have them all! 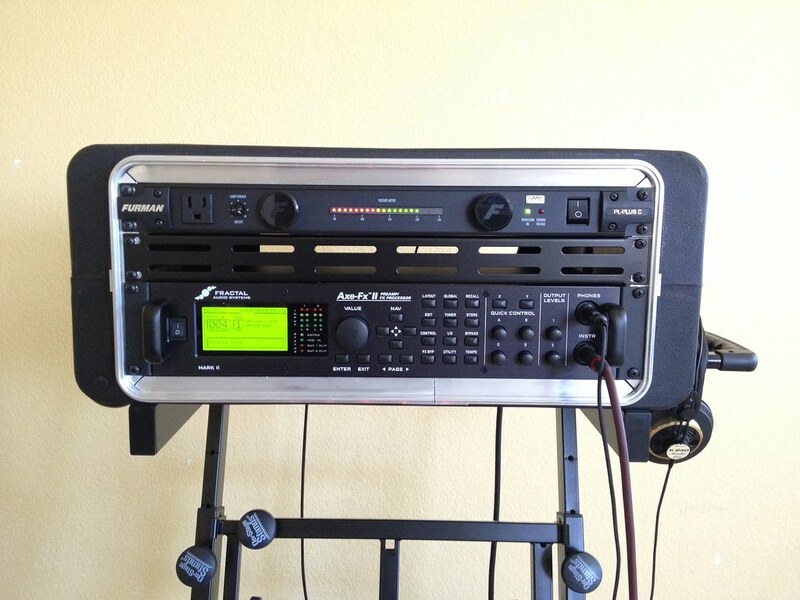 And, from that context, the AxeFX II is an amazing value. Having owned and managed the inventory at TM, the virtual stuff in the AxeFX II would be worth hundreds of thousands of dollars in "real" inventory - at dealer cost. There is no way I could have afforded to have all those amps, cabs, pedals, and rack processors (and all the cables and accessories to tie them together) and I would have needed another 10,000 square feet of space to tightly pack them all in to display and keep in inventory. All the mind-numbing routing and programming capabilities give you options that can be overwhelming at times, but you can dig in as little or as deep as you want. It can be a very simple rig (which is how I'm using it at the moment) or something that requires a degree to master the in's and out's. It's the user's choice. I do like the option being available to go in and tweak to my heart's delight but I'm more interested in playing than tweaking. Ultimately, sound is what matters. And the feel... I can play this for hours on end and I don't miss the tube amps at all. I may still want another tube amp someday and great tube amps will always be around, but at this point in my life, I just want something that is practical, super versatile, flexible, sounds and feels great, and will continue improving in the future with future updates. By the way, the Atomic CLR active wedge cabs sound amazing in their own right as I'm also playing my iTunes library through them with my MBA or various iDevices and this is the best hi-fi audio system I've ever had - beautifully balanced, extremely clear yet still warm and musical. And, at 500w each, it can get as loud (or as soft) as one will ever need it to be. And Tom King at Atomic is a great guy to deal with. This rig actually ended up being a lot more than what I was expecting: it's also a top-end home stereo system now and I'll now play my music collection through it rather than the Bose home theater system, which actually doesn't sound good at all for real music listening (too much lows with a tinny-sounding high-end and scooped mids). Another plus is that I can play the guitar and the AxeFX II along with the music from iTunes or YouTube or whatever through the same speakers. Simply everything is self-contained. It's a great time to be a guitar player and enjoy the sounds, features, and the convenience we couldn't even dream of only several years ago. Having grown up with LP records and also having gone through all kinds of guitar gear (both good and bad) over the decades, I can appreciate this kind of technology that much more. BTW, did I say I really like this rig? Wow~ this is a really nice set-up!! 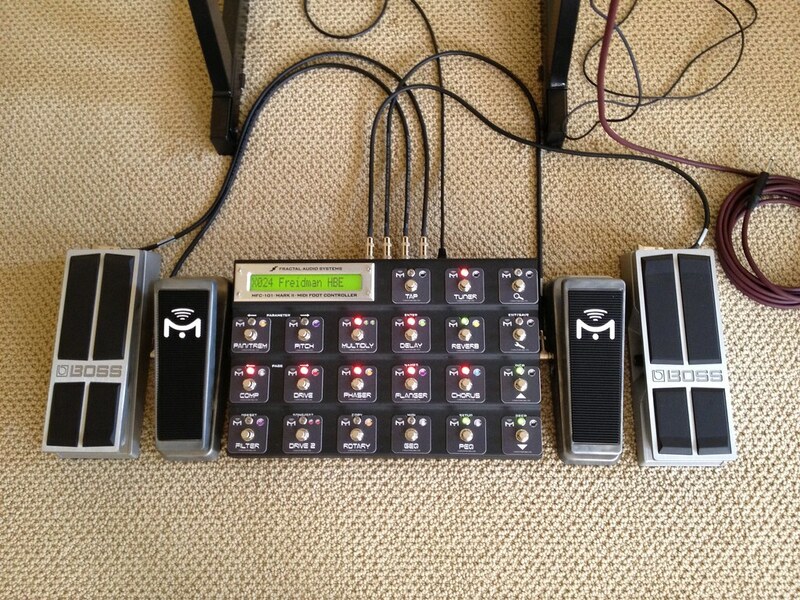 1) How are you using the Mission Pedal, as well as the Volume Pedals? 2) If you have to choose 1 electric guitar and 1 acoustic guitar to complete your "21st Century Rig", what would be your choices? 3) Which rack case is that? Thanks. I do like it myself. 1) From left to right, the Boss FV-500H acts as the input level control - essentially like a normal volume pedal in between the guitar and the amp. Guthrie uses his volume pedal in this manner to control the amount of gain going into the amp. I am really digging how dynamic the AxeFX II is in that I can take a vintage Plexi type of model with an overdrive pedal engaged and roll back the volume pot on the guitar and use the volume pedal to fine-tune the amount of gain to the AxeFX II. I can get really nice sparkling clean sounds to raging distortion by just using the volume pot on the guitar, this volume pedal at the input stage, and switching pickups. My personal favorite amp model in the AxeFX II is the Friedman HBE. The AxeFX II is so dynamic and sensitive that I can go from a beautiful clean sound with the single-coil pickup(s) and the volume pot and pedal turned low with a good amount of volume to a fully saturated lead sound just by switching to the bridge humbucker and turning up the pot and the pedal. The Mission pedal on the left of MFC-101 foot controller is the SP-1 that essentially emulates the look and feel of the old Clyde McCoy, Vox and CryBaby wah pedals. I can set the pedal in various positions of its travel and get the old wah sounds. Although the SP-1 has the footswitch to bypass or engage like those pedals, I found that the Auto Engage just works better and I'm not using the footswitch function. The Mission pedal on the right of the MFC-101 is the EP-1 that is spring-loaded. Basically, I set this pedal up to be like the Morley or "modern" type of wah pedal. I also use it for pitch-shifting for Whammy-like effects depending on the preset and it works really great in that application. I haven't gone really deep with this one yet. I find that the Morley and Colorsound wah types work better for really "modern" over-the-top high-gain sounds. One of my favorite wah pedals (and Guthrie has one of these too that I gave him when I was at Tone Merchants) is the German-made Silver Machine wah which worked great for ultra high-gain sounds - smooth with a wider taper than the vintage-style wah pedals. So the Mission pedal on the left is "vintage" while the one on the right is "modern". I plan to program the one on the right for more things like Whammy pitch-shift effects as well as controlling the speed of the rotary speaker and things like that but I haven't gotten that far yet. There is still so much more that I need to dig into. I'm mainly focusing on the different amp models right now. The Boss FV-500H on the right is mainly set up to control the overall output level (post-effects) going from the AxeFX II to the Atomic CLR cabs. So using this is about controlling the overall volume of the rig while the one on the left controls the amount of gain going into the AxeFX II. 2) I'm waiting for the Charvel GG Signature Model to be finalized as far as the electric guitar is concerned. I love the second prototype with the Birdseye Maple top over the Basswood body with the heat-treated Maple neck. I'd also love to get a Strandberg 8-string guitar in the not-too-distant future. Acoustic-wise, I'm a staunch traditionalist here and my dream acoustic is the Martin HD-28. I've owned several Taylors in the past but I was never able to bond with them for some reason. They're great guitars and play exceptionally well but there's something about the Martin HD-28 that I really love. Someday I'll own one. I don't want a cutaway or any electronics on it. I want it as "pure" as possible. While we're on this subject, I'd also love a Gibson Les Paul Goldtop someday - a '57 Reissue of some sort. I can't keep up with all the various versions that Gibson has. All I know is that I love the look of it (even more than the various sunburst versions) for whatever reason. Purely from an "old" guitar point of view, the Martin HD-28 and the Gibson Les Paul Goldtop really appeal to me and I don't know why. I just like them. I kind of ran into this while trying to find the ideal rack case at the local Guitar Center. It worked out perfectly. It's good to have the vent space above the AxeFX II. 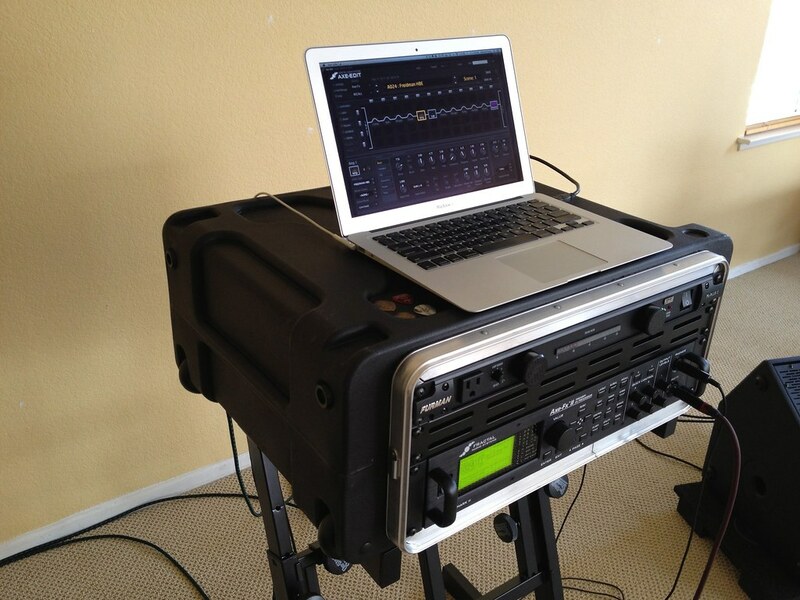 I had a compact SKB 3-space rack initially and noticed the AxeFX II got quite hot. So I got this spacious rack and now the AxeFX II is running much cooler with the space on top as well as on the sides and the bottom. The cool thing is that it's also deep, so I can store MIDI and USB cables in there as well as a Radial Engineering ProAV2 DI box which I use to run the iDevices to the Atomic CLR cabs with XLR cables. The instrument cable is the 15' Evidence Audio Forte and the four balanced XLR cables running from the AxeFX II and the Radial DI are the Evidence Audio Lyric HG. As expected, the picks on top of the rack are the Red Bear Big Jazzer heavy gauge with the grip holes (no speed bevel). I just got some from Dave there recently. Best picks in the business as far as I'm concerned and I think Guthrie will agree with that assessment. One more thing: I really like the Auralex Gramma beneath any kind of speaker cabinet - guitar cabinet, PA, studio monitor, subwoofer, etc. It seems to make the low-end clearer and tighter. I have a real aversion to boomy, fuzzy, and undefined low-end and the Gramma really seems to tame it down and make everything more articulate. In regular music listening, for instance, I can hear the kick drums and the individual bass notes better. So, now you have all the details. wow~ thanks a lot for your detailed reply. I always learn so much from your posts, even back in the Tone Merchants days. I already own an Axe-Fx II, now I just have to get everything else you mentioned! I am waiting anxiously for the Charvel GG signature model as well, I am sure it's gonna be a superb guitar!! However, I am surprised you didn't mention any Suhr guitars. I think you once mentioned that Suhr GG is one of the best instruments you have ever played? Well, I can only hold onto so many instruments. The Suhr Modern is a great guitar - especially the GG variants with their particular specs. I haven't really had a chance to check out other guitars over the past 10 years, so I'm looking around and discovering that there are many other great builders and guitars out there. 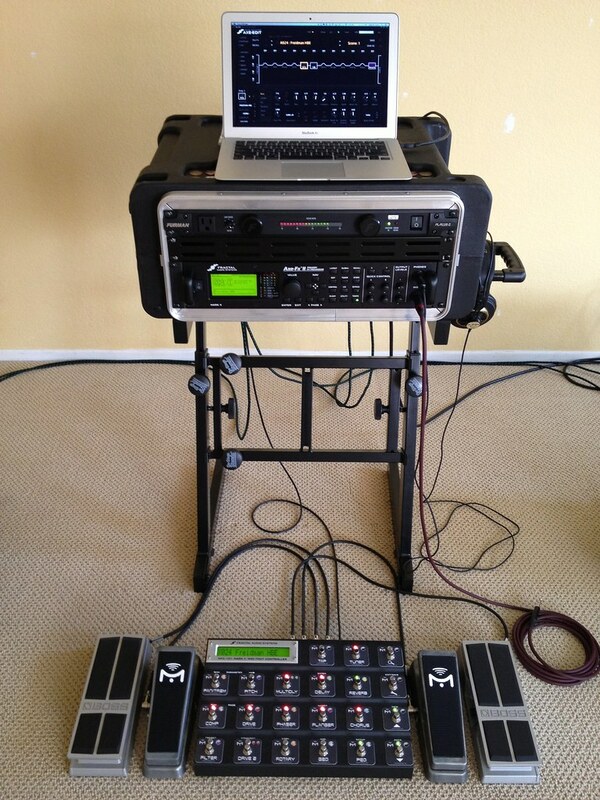 The same thing with amps - which is why I'm digging the Axe-Fx II so much. I'm getting to virtually try a lot of amps (like the Carol Ann, Blankenship, Friedman, etc.) that I've heard or read about but never listened to or played in person. There are so many great choices out there and there really is no one best guitar and/or amp builder. It's like the number of great guitar players. There are players like Guthrie, Jeff Beck, Allan Holdsworth, Pat Metheny, Mike Landau, Derek Trucks, Kurt Rosenwinkel, and many other greats out there. There is no one single best player - just many truly great players. The same thing with gear makers and I'm at a point now where I want to enjoy 'em all. I'm on vacation now with the family at a campground and see that Cliff at Fractal has had some epiphany that takes the Axe-Fx II to a new level. Hmmm... Now I'll be sitting at the beach wondering how much closer Cliff has taken the feel level to that of real tube amps. The sound is pretty much already there. It's the feel that still has some room for improvement - not that it feels bad in any way. It's about getting that last 0.1% right and that's always the most difficult. Even if you keep "doubling" the performance level with every tweak, now you're 0.05% away, and then 0.025% away and so on. And you may still never get there... But that's what makes it fun. I'm usually loathe to download anything beta but I'll be taking the plunge on this when I get back home this weekend. Thank you for taking your time to reply. Again, it's always a pleasure to read your posts!! Just got back from a short camping trip vacation and I couldn't help but think about this 11.0 Beta pretty much the whole time, so I did the backups and dived right into it. Well, now it really is that closer to the real amps in feel. As far as the low-end, all I can say is that it now has that thump that you can feel in your chest. It's noticeably more touch-sensitive with greater dynamics and will force you to play better, i.e. with more precision in your pick attack and in how you mute the unplayed strings. The sloppiness comes through much clearer now. The sound is now more three-dimensional as well. Is that "3D" thing exactly like some of the real tube amps that the Axe-Fx II models? I need more time with it at loud "gig" volume levels to get a better idea but, with the limited time I had with it so far, it's definitely more pronounced with 11.0. I've only had the Axe-Fx II for a little over a month and this already feels like I got a new unit to replace the old. The difference in sound itself in most presets and amp types is not very noticeable but the feel factor is a major leap forward. I am not going back to 10.12 and will patiently wait for the final 11.0 while I just get more familiar with the amp types. At least half of the joy of playing great tube amps is in the feel. Some cork-sniffing tube amp connoisseurs will say the feel is more than half of it. I'm of the mindset that it's about 50-50. FW11 Beta shows that Cliff really does understand the importance of feel. FW10 feels really good but it's just not the same - different in a good way. Now, it's much closer and feels even better. Some boutique amp maker once said that his design goal is to make the amp feel like the guitar's strings are connected directly to the speaker. Well, FW11 somewhat captures that mindset and I'm sure it'll only get better. Kicked the family out of the house today and spent several hours going through the various amp type at gig volume levels. What can I say? Everything just sounds and feels more alive and immediate to the touch. It'll take weeks or months to go through all the amp types and get familiar with 'em. It really does remind me of the days when I was at Tone Merchants and spending hours going through all the different amps. Sometimes, I'd just bond with a certain setting of one amp and play it without any regard to the time passing by. I find myself doing the same with a certain preset or an amp type. One of the presets that I thought really came alive is that of the SLO100. It was really one of my favorite amps at Tone Merchants. The only thing was that it needed to be turned up to painfully loud volume levels (the master at minimum 3 or, ideally, at 4) to get the amp to really breathe and sing. With FW10, I thought, "Yeah, it's in the ballpark but..." When I cranked the preset up today to a fairly loud but reasonable volume level, I couldn't help but grin and reminisce about what I liked so much about the SLO100 - cutting yet beefy with plenty of low-end thump and full warm mids. All of the old Marshall types seem to have benefitted the most with FW11B but all the Fender types sound markedly improved as well. I did notice a big difference with the ODS-100. It's much closer to what I've heard of it in person although I never had an opportunity to plug into one myself. But I've played plenty of Two-Rock and Fuchs amps when I was at TM so I do have a good idea of what the ODS is supposed to be like. Personally, I'm much more into the Brit EL34 kind of sound than anything else so I found myself spending much more time on those presets and amp types than anything else. I have a great deal of interest in ultra high-gain amps as well although I can only play through 'em for a limited amount of time before wanting to move onto something else. Well, my metal riffs repertoire is rather limited! I do think the enhanced bass response can be a little too much at times and I found myself cutting the bass with some of 'em. But then, I remember some of those amps really did sound and feel like that - having an obscene amount of bottom. I am a big Meshuggah and Fredrik Thordendal fan (and also Tosin Abasi) and I do plan to dial in those types of sounds when I get a Strandberg 8-string in the not-too-distant future. For now, I'm focusing more on the "classic" sounds. My head is spinning at the thought of going through all of the amp types and then programming my own presets with the effects all dialed in. Seriously, it may take a year or longer for me to program twenty of my own after learning all the in's and out's of what the Axe-Fx II is capable of. For now, I'm just a wide-eyed player who has walked into a 10,000 square foot boutique shop with hundreds of different boutique and vintage amps, cabinets, pedals, and processors all strewn about on the display floor. And I intend to try every one of 'em... This is just too much fun. Has Guthrie tried using Axe-Fx II live though? Seems like he has only been using Axe-Fx II for these types of recordings? No, he hasn't tried using his own Axe-Fx II live yet. He has played through it live as a guest at a Dweezil Zappa gig and it sounded great (much more Cornford-like) but he hasn't really settled on an amplification system as he just hasn't had the time or the environment to experiment. 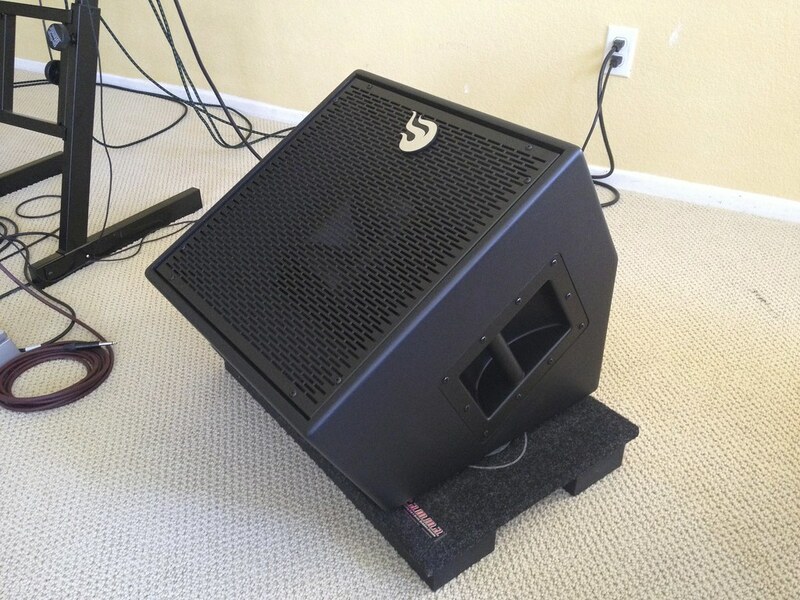 There are so many ways to amplify the Axe-Fx II: FRFR (which is what I have with the Atomic CLR's) and/or straight to the house with the cab simulations and IR's or into a guitar power amp and cabinets with normal guitar speakers with the cab sims turned off. The weekly Fellowship gigs at the Bassment are no more and those gigs would have been the perfect setting to experiment as he can't just insert a new amplification system that he isn't familiar with to the Steven Wilson and Aristocrats tours. 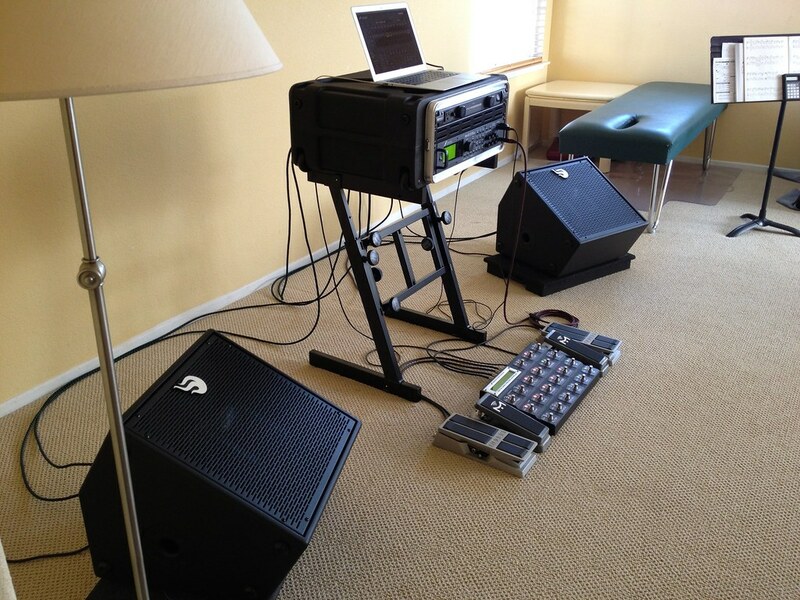 I'm sure Guthrie will eventually get around to trying the Axe-Fx II live but he's not going to do that during big tours. For Guthrie, something has to be tested extensively in a live setting with a band to know if it'll get worked into his tour rigs. Trying a piece of gear out at a music store or even at home and how it sounds on its own is pretty much meaningless to Guthrie. He's always thinking about how a piece of gear fits in in a band mix. So I recently updated the Axe-Fx II with FW18.03 with the new "G3" technology after hearing about it here and there for sometime now. The beta version had been available for a while but I don't like to mess with beta stuff so I waited until the final release was ready. Well, Fractal likes to keep telling us that each major FW update is a big leap over the previous versions and some have been more so than others but I was quite curious about this one. I've checking out some clips of the beta version of the 18 and could hear that it's getting even more "realer". After spending some time with the updated Axe-Fx II this weekend, I can indeed say it is a significant improvement and that it's that much closer to the real amp-in-a-room feel. And at the bedroom volume levels that I'd normally play, it's actually preferable over the BE100 rig and I'm talking with a raw dry sound - no effects whatsoever. It's really cool that high-end digital modelers can keep getting better and better with periodic firmware updates. Normally, high-tech devices become obsolete in 2~3 years but this Axe-Fx II device has improved a huge amount since I first got it around two years ago. And my understanding is that the DSP's in it still has plenty of headroom left for more FW updates in the future. Really cool... I'm looking forward to a new FW update on the Amplifire unit. I'm really digging that too although I wouldn't quite put it in the Axe-Fx class. 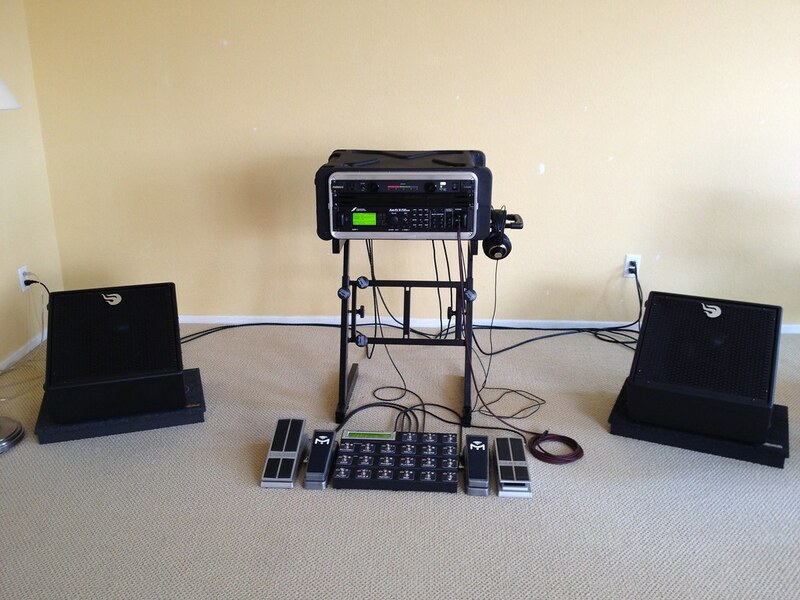 The amp models are superb and very usable but doesn't quite have the feel of the Axe-Fx yet. Also, the effects are definitely not in the class of the Axe-Fx but it's also about one-fourths of the price so I don't find that to be an issue for what it is. 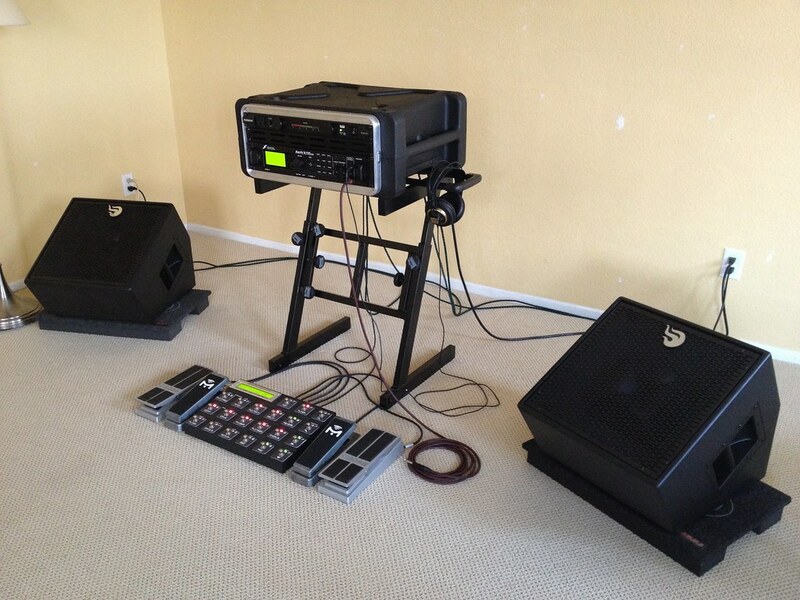 For live usage with a band and all kinds of audio gremlins in the PA, effects really aren't as critical. Kudos to Fractal. It's an amazing device for us guitar players and it just keeps getting better and better every 6 months or so.